Will Most Dogs Soon Look Like Pit Bulls? Stacey Coleman is the executive director of the Animal Farm Foundation, which runs a shelter in upstate New York, particularly for dogs from cruelty cases. The A.F.F. operates a training program that prepares shelter dogs that are called pit bulls to be adopted as assistance dogs for people with disabilities. The foundation also provides educational and financial support to organizations working to secure equal treatment and opportunity for dogs who have been labeled as pit bulls. Michael Mountain: You told me a few months ago that in maybe 20 years or so, most mixed breed dogs in America are going to look like what we call pit bulls today. Stacey Coleman: Yes, you know that could very well be. I’m not a geneticist or an expert on the evolution of dogs, but I remember when most dogs in shelters were called shepherd mixes, and when you have a popular-looking kind of dog, then the dogs that end up in the shelters carry that appearance. So if the majority of dogs that come into our shelters look like what are often labeled pit bulls, we’ll need to help people understand that this is just the way the dog looks. It doesn’t tell us anything about who that dog is or how that dog will function as part of our family. M.M. : It would be pleasantly ironic, almost poetic justice, if we end up in a country where most dogs actually do look like the dog that we were once most afraid of. S.C.: I suppose that would be ironic, wouldn’t it? M.M. : I mean, is that seriously in the cards, do you think? S.C.: It’s quite easy for me to imagine because I have several dogs that would fit that description. I have many friends whose dogs fit that description, too, so for me it’s a pretty easy world to imagine. And when we talk to shelters all across the country, we often hear them say, oh, 75 percent of our dogs are pit bulls or 63 percent of our dogs are pit bulls. But then, you know, we have to stop them and say wait a minute, what that really means is that you’ve labeled 75 percent of your dogs as pit bulls. It doesn’t tell us anything about their behavior or adoptability or anything else. We need to describe what we actually know about these dogs, like that this dog knows how to sit and stay, or that dog has been friendly with children, or this one was surrendered by a family with three other dogs and two kids, but they couldn’t afford to keep the dog anymore. That’s the kind of information that’s important to adopters. M.M. : What was your own first experience with a pit bull? S.C.: It was in the late 1990s. I picked up a dog outside my office building in Indianapolis, and she jumped in my car and was all smiley and waggly, and I remember looking at her and thinking to myself, this is a pit bull, I need to be afraid of her. But that went against everything I was seeing in the dog in front of me. Still, I allowed that voice to override my common sense at that moment, and I called the local humane society to come and get her. And then it occurred to me that I should actually be supporting this dog. So I called them the next day, but they said they were going to kill her because she was a pit bull. It took me about seven days and phoning an attorney to get the dog away from the humane society, but I got her back. And I’ll be honest, for a couple of weeks I watched that dog really closely because I was waiting for her to do whatever scary thing it was pit bulls were supposed to do. But she just didn’t do anything. And it only took about two days to convey to her that she wasn’t permitted to chase my cat, and she understood and she stopped chasing my cat. She got along lovely with the other dogs that I had in my house. So, that’s what really changed my perspective, and that’s when I started helping dogs called pit bulls. M.M. 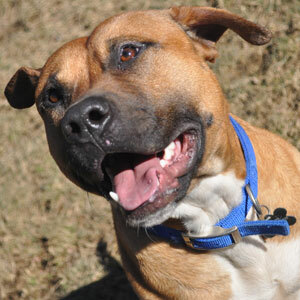 : There’s still a lot of confusion, isn’t there, over what is a pit bull? S.C.: Dr. Victoria Voith’s study showed us that more than 75 percent of the time, when shelter workers try to visually identify dogs of unknown origin, they get it wrong. Shelter software like Petfinder forces them to assign them a breed label, so they just do the best they can. And a lot of the dogs end up getting labeled pit bulls or pit bull mixes. And with that comes the assumption that there is going to be a certain set of behaviors and characteristics. But every dog is different, so you can’t predict a dog’s behavior based only on her breed. And when you have a mixed breed, which is what most of the dogs in shelters are, those kinds of predictions just aren’t accurate. When people come to shelters to adopt a pet, they usually come with a set of expectations and perceptions – that a dog who looks like this or that is going to behave in this or that way. We want people to see the dog in front of them instead of the label on the kennel card. M.M. : There’s actually no such breed as a pit bull at all, is there? S.C.: No, it used to be considered shorthand for American Pit Bull Terrier, but the definition of pit bull changes from place to place. 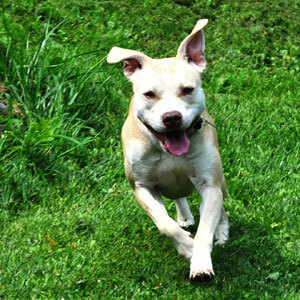 In Omaha, Neb., there are more than seven pure, recognized breeds of dogs that are legally considered to be pit bulls. And any dog who carries the physical characteristics of any of those seven breeds of dogs can also be legally termed a pit bull there. M.M. : And there are plenty of cities where the definition of a pit bull is whatever the animal control officer or the policeman who knocks on your door says it is. S.C.: That’s exactly right. And even guaranteed and verified genetics is not a guarantee of behavior in a dog. The behavior of pure breeds varies a great deal from dog to dog. The important thing is to look at the dog in front of us, and get to know that dog as an individual, instead of making assumptions about what type of breed or breed mix we think the dog is. M.M. : I once had a Doberman who used to love to run up to people. They’d freeze, thinking they were going to be attacked. And then he’d just sit down in front of them and demand to be petted. I think it was his idea of a joke! But the joke stopped working when, over time, people stopped being afraid of dogs with that Dobey look. Do you think the same thing will happen with dogs with the pit bull look? S.C.: I hope so. But there’s one more challenge today that those other dogs didn’t have back then, and that’s the Internet. That’s because the stories that are told about pit bulls, true or not, live forever on the Internet. And when you do a Google search on the dogs, you find all this information, and some of it’s real and some of it isn’t. But it’s all still there. And there’s also the 24/7 news media coverage. So whereas the Dobermans and the German Shepherd Dogs were able to overcome this faster, I think it’s going to take a bit longer for the group of dogs called pit bulls because the stories about them just never seem to go away. M.M. 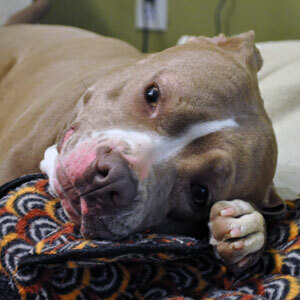 : When did it all start going wrong for pit bulls? S.C.: I can’t say exactly, but in the mid-1980s they certainly started becoming a hotter topic in the media. And then Sports Illustrated ran that notorious cover story warning people to beware of this dog, and that’s what sort of snowballed the mainstream media to start villainizing this particular group of dogs. And the irony of it is that that sort of media coverage is what made the dog more appealing to the kind of people who wanted a dog not to be part of the family but for negative things like guarding or intimidation or status. M.M. : What’s your favorite adoption story? S.C.: We got this big dog in, and we named him Fridge – after William the Refrigerator Perry who played for the Chicago Bears and was a really big guy. Fridge had been at a shelter for nearly four years, and he’d gotten so used to barking that he just wasn’t getting adopted. We also discovered that he had separation anxiety. Now, that’s one of the hardest behaviours in a dog to find a home for. But then we got an application from a truck driver. He was on the road three weeks out of four. And he’d been turned down by several adoption agencies because he wasn’t home enough. But when he told us he was looking for a companion, we said we’ve got just the perfect dog to ride in the truck with you. And he has the best life now. We get the best photos of Fridge on the road, hanging his head out the truck window, driving through counties on his rolling, 18-wheel couch. It’s one of my favorite adoption stories. Note: All the dogs pictured are currently available for adoption through Animal Farm Foundation, just click the photos for more information. Um, on that last paragraph..now I want to see some pics of fridge in the truck. Think you can arrange that at Stubbydog? LOL. I have noticed all the things this article mentioned in the past fourty years or so.It used to be that long coated dogs were considered sheperd mixes and that smouth coated larger dogs were considered Lab mixes.now every dog is a pit mix or chiahauhau . I have notice a change in pit bull and pit bull type dogs over the same period.Not all the dogs were culled because of the lack of fight or in the ones used for hunting lack of prey drive.Often they became familly pets or gaurdians.It almost was like a different type of the same dogs was starting to be born.there willing to please and loyalty made them worthy of house dog and companion,not just yard dog.I often wonder these days how much of the original terrier was bred out of them.my understanding was that it was the terrier in them that made them have the prey drive.where they could set out on a hunt and not rely on there owner`s look of aproval to drive them on.I was told that it was the terrier part that also was part of the reason people say dog agression is to be expected from them.this was told to me some thirty years ago. With all the over breeding because of there popularity and the large number of pit bull type dogs out there.How much of the original pit bull is out there?I often come across owners who love there dogs but are afraid to socialize them because they still have that fear or stigma towards there own dogs.wiether they choose to admit it or not.It seems like we have created a gentler breed one with a lot less prey drive if any. I own two pit bull type dogs and only one is prey driven.Both have been socialized with other dogs people and kids.Both are adopted and were between 1.5 and 2 years when i got them. while these look like the dogs of 40 years ago they are different.with this many pit type dogs in shelters I think it is possible that soon if they are not already be the most popular dogs. Technology has been there down fall with the same bad storys repeating them selfs.i do see a change in the numbers of bsl and bans being repield on what seems like a monthly basis.so we must be working towards that soon all dogs will look like pit bulls population. sorry for the long rant and misspelled words. @JonDBui We love your observations. And while the Internet age may hurt the reputation of pit bulls, it can also be their best ally. So let’s keep changing the conversation! What a wonderfully written article! 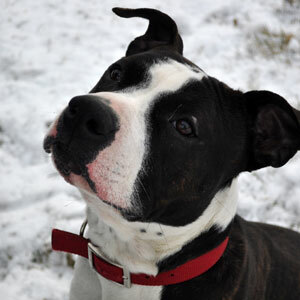 If the day ever comes when pit mixes are all that is available in shelters,then I will buy a dog from a breeder! I like shepherd mixes,golden mixes and huskies! I have gotten these dogs in the past from shelters,but I have no desire to own a pit bull or pit mix! In response to “Smileydog” who posted preference for shepherd mixes, golden mixes and huskies….but would buy from a dog breeder if faced with only “‘pit bull” or “pit bull mixes” choices to adopt at shelters. I want to take this opportunity to point out how thankful I am to live in a country as great as the U.S.A. which allows each of its citizens to express personal opinions, regardless of how far left or right from the middle of mainstream public perception. The personal freedoms that we enjoy affords each of us individually and as a group collectively to have a voice and be heard even if our voice expresses an unpopular, uneducated, offensive or downright asinine opinion. Thankfully, these liberties like free speech are the very reason that those of us who DO go to shelters and DO adopt “pit bull mixes” are able to have a voice to protect those living beings who do not have a voice, cannot speak for themselves and would suffer greatly at the hands of individuals ignorant and unwilling to learn. I have adored Goldens, Shepherds and other mixed breed dogs. Regardless of any dog’s looks, it deserves to be loved and have a lifelong place in a family of its own-including pit bull types. As a dog lover, there is no dog in the world that deserves to be rejected or denied a loving life based “looks” anymore than you or I should be denied a chance to live free of suffering and pain. Because of the right to express our opinions, you may express your views of “pit bulls”. 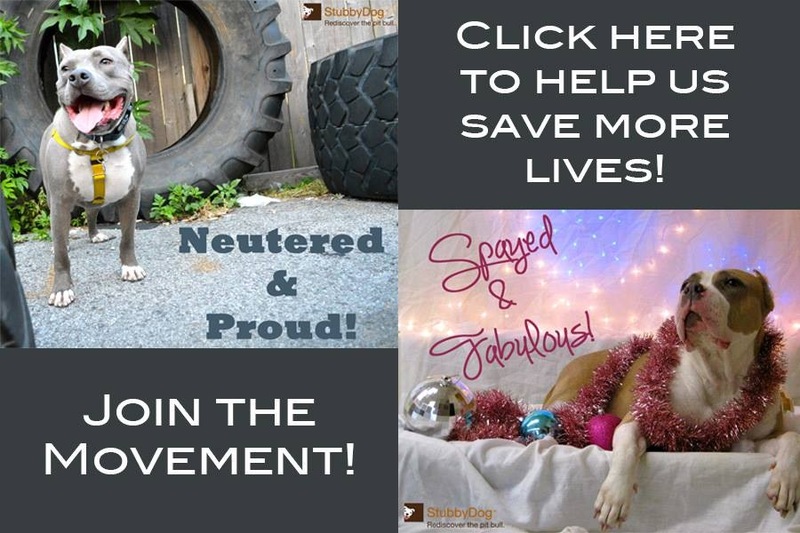 Thankfully, because of the efforts of advocates (like Stubby dog supporters) working tirelessly to educate against breed specific discrimination and to protect “pit bull types” from suffering due to ignorant people, all dogs will benefit, including the limited category of dogs that you like (Golden, Shepherd and Husky mixed breeds). Thank God for Stubby Dog, pit bull owners and free speech. Without “pit bull” owners and advocates, all dogs would suffer the harmful effects of breed discrimination. @Debi Bel you said it beautifully thank you. We acknowledge that people may have a preference to a certain type or breed of dog, but as you said, all dogs deserve a great life filled with love and pit bulls are no exception to that, because here at StubbyDog, we want people to see them without discrimination, but as just dogs!